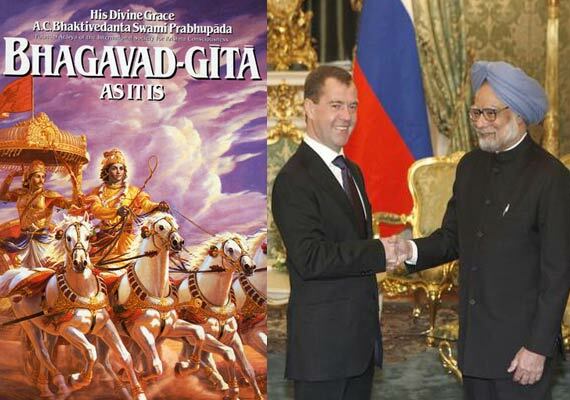 THE HINDU: A Russian court on Wednesday rejected a second bid to ban a Russian translation of the book “Bhagavad Gita As It Is”. Following an uproar in India and Russia against the trial of the sacred Hindu scripture the Tomsk prosecutor modified his petition exempting the canonical text Bhagavad Gita from the charges of extremism and asking the court to ban only the Russian translation of the comments written by A.C Bhaktivedanta Swami Prabhupada, founder of the Indian Society for Krishna Consciousness (ISKCON). However, the second plea was also rejected. Wednesday’s ruling brought cheers from India’s Ambassador to Russia Ajai Malhotra, who throughout the trial waged a diplomatic battle against the legal attack on Bhagavad Gita. “I welcome the verdict of the Honourable Regional Court in Tomsk today, which has dismissed the appeal petition in the Bhagavad Gita case,” the envoy said in a statement for the press. “It is good that the decision of the lower trial court in this matter has been reaffirmed. I trust that this issue is now conclusively behind us,” he added. Russians lack awareness about Bhagavad Gita, and this was one of the reasons for the court case against the text, said Sanjeet Kumar Jha, President of the Indian Association in Russia. Mr. Jha told a press conference in Tomsk that the Indian Association had set up a council of Hindu communities in Russia which will engage in dialogue with other religious groups and spread information about Hinduism. A spokesman for the Tomsk prosecutor’s office did not rule out that the higher level prosecutor may appeal against Wednesday’s verdict after studying the court’s arguments.